With the SVAT CLEARVU2, all you need to do to start the recording is connect the 4-channel DVR to cameras (not included), plug into the power supply and push the start button. 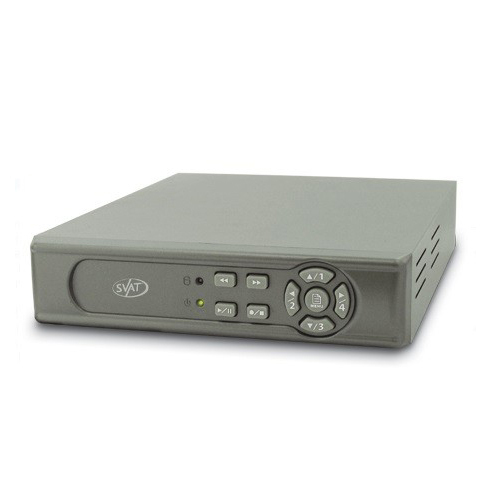 Featuring the auto start recording and many more such features, this DVR is a simple-to-use but highly effective system. With a 160GB Seagate hard-drive, the DVR lets you record non-stop for 154 days. As the hard-drive memory approaches its capacity, the DVR sounds the 'hard-drive full' alarm. The data from the system memory can be archived with ease using a USB driver. Besides password protection, motion detectors, and scheduled recording, the system also sports a feature that allows you to view the footage from all cameras at once. Even when the live recording is on, you can pause, rewind or fast forward the video footage without affecting the recording process. The play back option also allows you to view the footage at 1x, 2x and 3x speeds enabling quick browsing of the stored video. The DVR will automatically begin recording when first powered on. This makes it easy to setup the equipment and ensures instant recording capability. The built-in 160GB HDD gives you a maximum of 154 days of continuous recording. The Seagate HDD has been further optimized for the DVR, allowing for better read/write speeds and reliable recording. The warranty is covered by Seagate itself and lasts up to 5 years. The password protection feature ensures that unwanted people do not meddle with the settings of the DVR. It also prevents unauthorized personnel from halting the recording process. You can configure the DVR settings to record only when motion is detected and alerts the observer with an alarm. This setting can be assigned to specific cameras as the situation demands. The recorded footage can be transferred to any USB and the system memory cleared for further use. The backup also makes it possible for viewing the videos off the surveillance site. Software is included with the kit for easy viewing of the videos on a computer. The Quad screen display of the monitor lets you view all the cameras simultaneously. This helps you obtain the total perspective of the field at one go. You can also view individual camera footage on the whole monitor screen. Please note: Cameras are not included with this DVR system. You can set up a 24-hour recording schedule based on the desired preference. This can maximize the memory by scheduling high quality video recording only during peak hours of the day. All you need to do to extract the desired footage is enter the date and time range. Certain clips can also be labeled by events. This makes it easy for you to retrieve footage especially recorded by motion detection. If there is an interruption in the power supply to the DVR, this feature enables the DVR to retain the previously configured settings and resume recording. SVAT® and Defender® highly recommend the use of an uninterruptible Power Supply (UPS) with surge protection for all products. SVAT® and DEFENDER® do not endorse any SVAT® and DEFENDER® products for illegal activities. SVAT® and DEFENDER® are not responsible or liable in any way for any damage, vandalism, theft or any other action that may occur while a SVAT® and DEFENDER® product is in use by the purchaser. ©2015 SVAT®. All rights reserved. SVAT®, the SVAT® logo and other SVAT® marks may be registered. All other Trademarks are the property of their respective owners.